A new upgrade to our Google App Engine powered CRM application and Online Database App-creator, has added support for Exporting and Importing data in CSV format, along with support for bulk-delete. take away your data at any time from our database - No vendor locks. In this blog post, we will have an overview of this new feature, as used in iFreeTools Creator, the approach will be similar in iFreeTools CRM too. In the default list views, there will now be an option under More Actions to Export as CSV and Import from CSV as shown below..
First export the data as a CSV file and store it locally. This file acts as a backup of the existing data and can also be used as a template to add new data. You can use any spreadsheet application which supports editing of CSV files. We will use Google Docs for this feature preview. 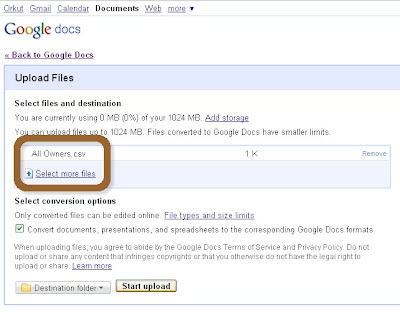 Use the upload option to upload the CSV file to Google Docs.. The spreadsheet will be loaded and will show the entries as present in the iFreeTools database..
We can now add / modify entries in the spreadsheet. We will add 2 new records - of which 1 record will have values in unicode (Tamil language) and update the existing records by adding some notes. The changes made to the spreadsheet are highlighted in the image below..
Now download the modified file from Google Docs, by choosing from the menu File > Download as > CSV (current sheet). Now you can upload the file to iFreeTools. Choose the Import from CSV option and specify the file downloaded from Google Docs and click on Import.. This will import the data into iFreeTools' database, as shown below..
Notice that 2 new entries have been added, with proper handling for unicode characters and that 3 existing records have been updated with notes. The status message on top also provides the details of the import. Further changes to the imported data can be performed using the Bulk Edit feature, which was added recently. This update also includes the Bulk Delete option, available under More Actions. Hope you like our new features. If you face any issues or have suggestions, feel free to use the feedback form in our application.